The Civil War and American Art is a phenomenal book and exhibition put on by the Smithsonian American Art Museum and The Metropolitan Museum of Art. This challenging, enchanting exhibition illuminates its viewers as to how artists responded to the war and its ambiguity. Collectively, these works of art make clear that war not only radically changed American politics and culture, but that it also unleashed a change in American visual culture. Nineteenth century art abounds with metaphors, and American art from this period is no exception. Perhaps since photographs were already bringing grisly images of corpse strewn fields to people’s doorsteps, artists rarely depicted battles of the war. 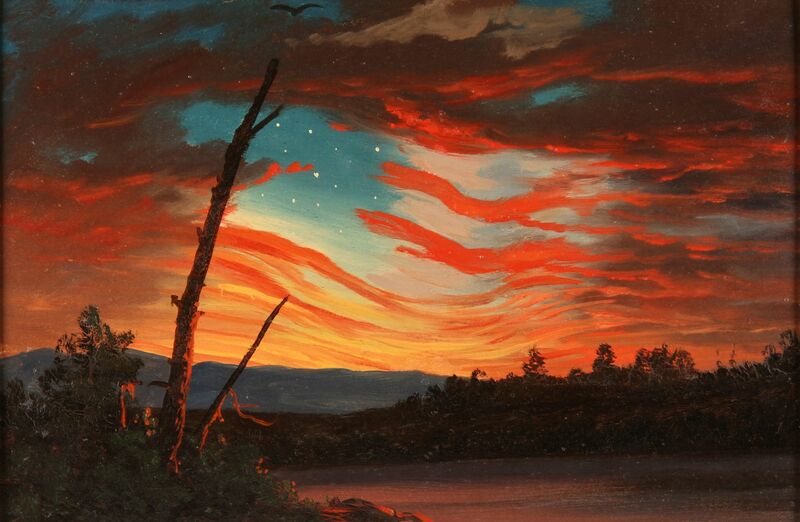 Instead, landscape paintings served as weather vanes of the Nation’s emotional tumult. As will be discussed in the second and third installment of articles about this exhibition, depictions of race during the civil war and the toll the Civil War took on soldiers are also prominent themes taken up by this exhibition. In the early nineteenth century, the natural resources of the United States became sources of national wealth and pride. 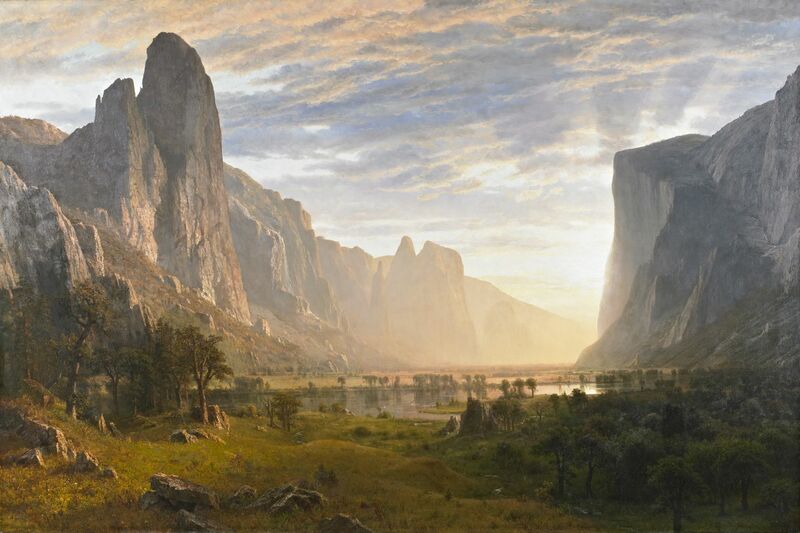 Artists such as the Hudson River School painters sought to glorify natural wonders. Pristine images such as Niagara Falls and Natural Bridges were put on par with paintings of classical sites from Europe. As the Civil War drew close, American landscapes took on a more ominous tone. This exhibition shows that though these new landscapes were not specifically about the war, they are clearly infused with its tumult. Darkened skies permeate the landscapes in this exhibit. 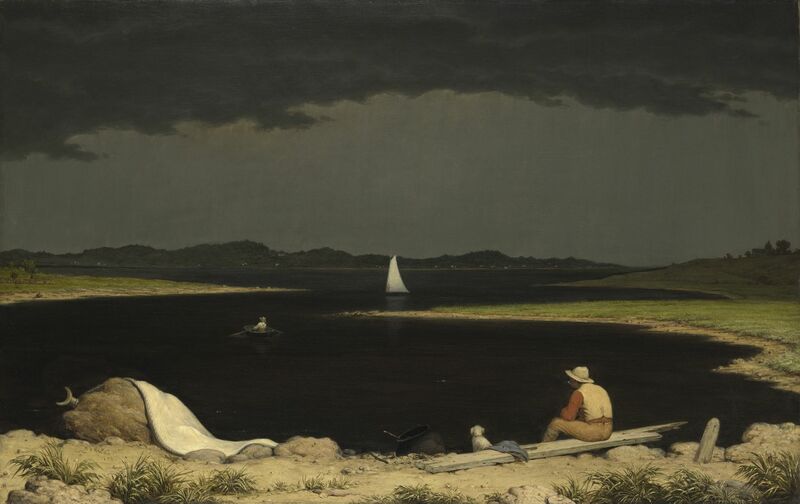 Weather is cloudy, bleak, and rife with foreshadowing in paintings by Martin Johnson Heade, Frederick Kensett, and Eastman Johnson. All three artists belonged to a church of Henry Beecher—a Lincoln supporter and an abolitionist preacher whose sermons were filled with references to the coming storm when God would get tired of slavery. These artists incorporated these metaphors into their art. Heade depicts a darkening sky, an approaching storm. 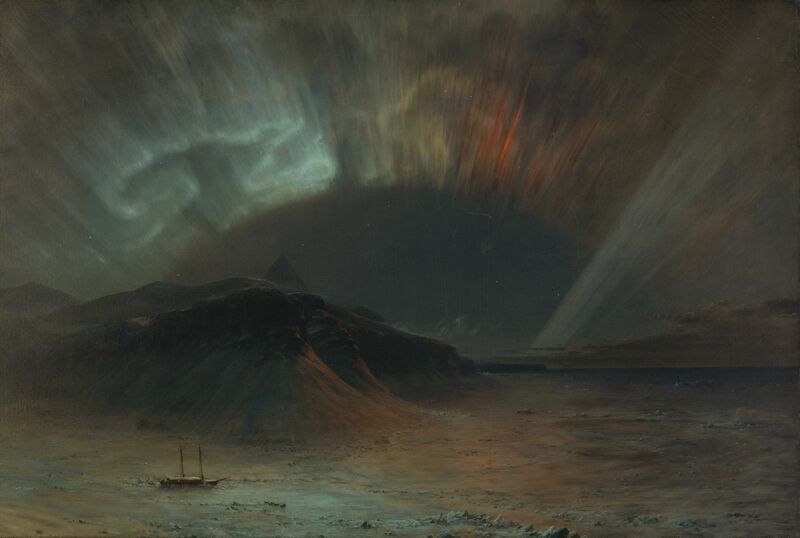 During the war, Frederick Edwin Church (whose paintings make up a large part of the exhibition) painted a darkly lit aurora borealis that, according to curator Eleanor Harvey, evoked the uncertainty of how and when the war would end. The war also colored interpretations of natural phenomena. 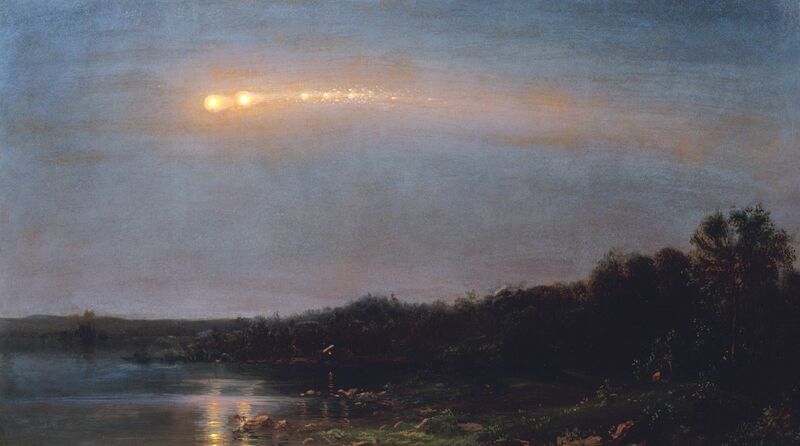 The comet that appeared in 1860 was read as a portent of unavoidable sectional strife. Edward Church’s Meteor of 1860 (1860) not only refers to 1860 as “the year of the meteor,” but also to Lincoln’s inauguration and John Brown, the staunch abolitionist who sparked the Harper’s Ferry revolt. Poets including Herman Melville and Walt Whitman, who called Brown “the comet who came unannounced,” made the association of John Brown with a meteor. Church’s the North (1861) was put on view eleven days after the attack on Fort Sumter and depicts a defiant iceberg-moving south (the American South was often associated with the tropics). By 1862, in Cotopaxi, we see fear in the form of Church’s erupting Cotopaxi volcano. 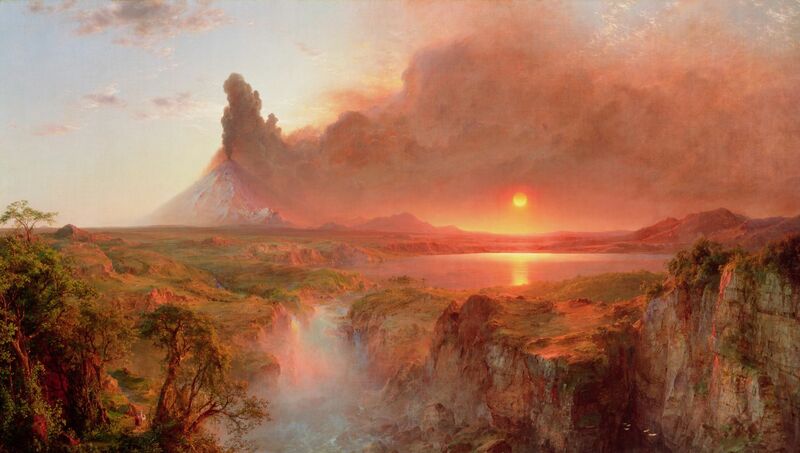 While the volcano was a favorite topic of Church’s, this was the first time he painted it erupting. The volcano metaphor was widely used and recognized to express the tumult of the unstable war. Frederick Douglas termed slavery as a “moral volcano.” Critics described the painting’s “war clouds.” The New York Tribune called the volcano’s eruption “pillars of warning.” When the war finally did end, Church evoked scenes of hope in rain-bowed landscapes and Albert Bierstadt created scenes of California’s Yosemite Valley bathed in the light of dawn- a beacon for the future. Landscape paintings such as Church’s were no longer utopic visions of the Catskill Mountains that were so prevalent just a few years before. Landscapes during the time of the Civil War carried different meanings. Oncoming storms were seen as omens of destabilization. Artists of the works in the show understood the power of skies to reflect what people were seeing, feeling and experiencing. The works in the show often ask the viewer to sober up and ask hard questions. The paintings become at once both intensely personal and universal. We think of what 9/11 did to our nation on one day, and then ponder what four years of destabilization would do. We are encouraged to look closely.